I will be spending the next few days on a lovely Greek beach, enjoying the sun, sand and sea. I'll be sipping on cocktails and eating some scrumptious Greek food. I'll be enjoying my time with Soeren and Tom and just breaking free from the daily routine and hectic life. No appointments, no meetings, no phones, no mails and no stress! Just the three of us having a fun time and a much needed break. Yes, we're packing our bags and are off on vacation to the lovely Peloponnese. Oh, I know you all are a bit green. 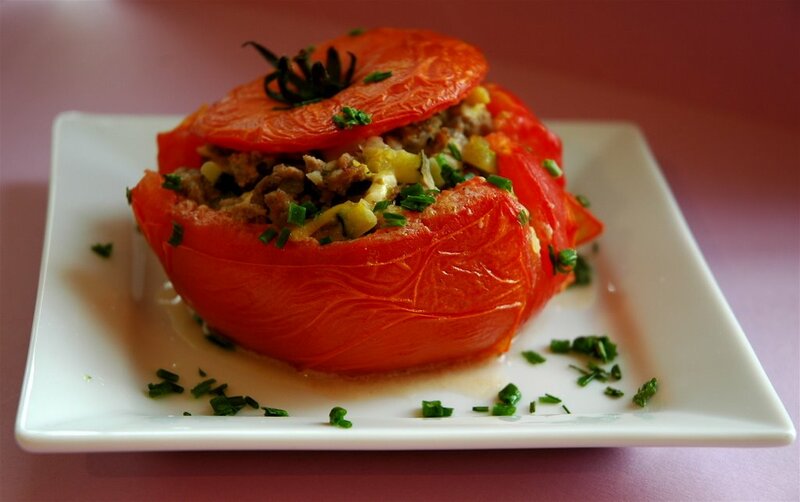 But don't be - to make up for it I am leaving you with a gorgeous recipe - Greek Stuffed Tomatoes. Furthermore, I'll be taking lots of pictures and when I get back I will share them with you. So, hopefully we can all gather around and re-live the vacation once again. Give me a smile! Just promise to miss me a bit - LOL! I know I'll be missing you! A few days ago I decided to kick in the vacation mood and make something Greek. I really love Greek food as I find it healthy made of fresh ingredients and just full of sun! 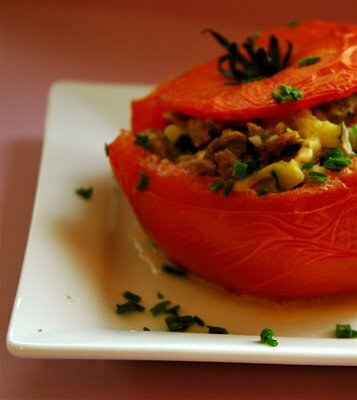 There certainly are many variations to stuffing your tomatoes and I am sure everyone has their own recipe. I particularly like this one as it combines the lovely tastes of feta, garlic and zucchini along with herbs like oregano, giving it a wonderful aroma. So as I head off on my vacation I hope you enjoy cooking this up. Monthly Mingle: Take Two - Deadline October 12. I've designed this logo and hope anyone taking part in the Monthly Mingle will use it as part of their entry/post. Mixology Monday: Exotic Drinks - Deadline October 16. I'd really love to see a few of my regular readers taking part in this issue. So, folks join in the Exotic cocktail party! Jack Johnson - Upside Down. Great vacation feeling sound! Heat the oil in a large pan and fry the mince until nice and brown. Add the onions, garlic and zucchini and continue to saute for a few minutes. Pour in some of the stock and mix in the crème fraiche. Add the nutmeg, paprika, salt, pepper, oregano and parsley to the mixture. Take off the heat and now add the feta cheese. Fill the mince into the tomatoes and place the lids back on top. Pour the rest of the stock into the ovenproof dish and bake for 15 minutes. Serve with either light and fluffy mashed potaoes or wild rice and sprinkle with chives. Greece here we come!! Such a perfect combination of ingredients that shout out Greece. The oregano passed on it's artomatic flavor to the entire dish really well. There is something about this herb that always takes me to the Mediterranean area. I just love that feeling. When you bite into something and BANG! you are beamed to dream location. If I really had to, I would probably choose this as my very favorite herb and that is why I am sending this off to a Weekend Herb Blogging special at Kalyn's. However, my taste in herbs change from season to season, mood to mood and taste to taste so I can never really pin point THE ONE favorite herb. At the moment it's Oregano!! 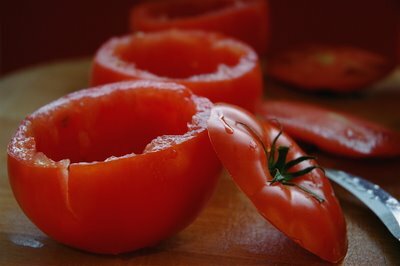 I baked the tomatoes for 15 minutes but I would recommend checking after 10 minutes if they are done. As I wanted to lift the first tomato onto the plate for a picture it kind of collapsed on me. I just managed, with great care, to get this one on the plate and take a half way decent picture. The others were also OK to serve, but the next time I certainly will be checking a little earlier. We had the tomatoes with mashed potatoes and I found this a great side with the stuffed tomatoes. For my vegeterian readers, you can always substitute the meat with finely chopped mushrooms or even a combination of normal and wild rice. You can also use the mashed potatoes as a filler too. Now, we are really beaming off to Greece. See you when we get back. A'dio! I hope you have so much fun! It does sound wonderful. I've been to Greece once and loved it. Thanks for fitting this in before you left and your vote for oregano has been duly recorded! Have fun dear girl and that's a beautiful recipe. Will have to think of a replacement for the meat, if I have to try it out, something like shredded cauliflower? I can't get over how good this looks, Meeta! I've never been a stuffed tomato fan - but I've never seen one stuffed with these ingredients.. yum! Thank you, as always, for sharing.. I really want to try these! Have a safe trip and a wonderful holiday!! Can't wait to hear all about it when you get back!! Have a fantastic time in Greece, Meeta! Can't wait to hear about it. Not green at all abt your vacation,everybody needs a break but I'm feeling blue bcos my tomato plants are breathing their last! Well!! Have fun!! OPA as they say!!! That's really funny--I just put up stuffed tomatoes too (I didn't copy you, really!). Have a great holiday in Greece! WOW! The Greeks would be so proud of you. Thanks for this recipe. Looks Yum! Feta, Tomato, herbs?? I'm there!! Opa! have fun in Greece. Gorgeous tomatos! I hope you are having tons of fun in Greece. I love Greece, and have had many holidays at it's many islands over the years. We recently had our honeymoon in Chania, Crete, and the food was lovely. Thanks for reminding us with such a simple yet effective recipe. This looks so great! I love the flavors of Greece! Have a great trip! And thanks for the MMs reminder..
Have a great time thanks for posting this recipe first as you will have too much fun once you get there. Thanks everyone. Glad that the recipe suited your fine tastebuds. Looks like a great recipe. What proportions for the spices did you use? IvanYes, it really was a great recipe. The spices I normally use from my feeling. I add a little, taste and then add more if required. I would recommend the same to you. Check how you like the taste, experiment and play with your food ;-) Let me know how it tasted!